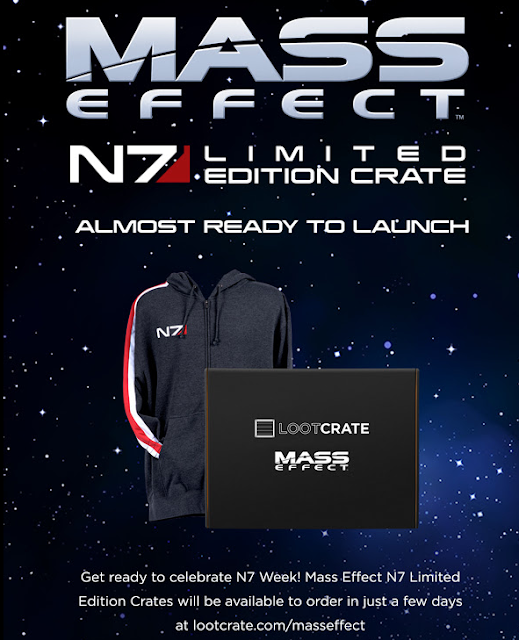 Loot Crate has teamed up with BioWare for another limited edition crate and it's all about Mass Effect this time! In a few days, sales will go live!! Hopefully, they've upgraded everything and are more prepared this time around. I believe that this box is limited to one per account, similar to the Fallout one. You don't have to be a subscriber but I think you will have to make an account. The Cost: $75 one time charge, shipping is included! What You Get: $150 plus of rare Mass Effect collectibles, including cool apparel. I'm assuming the spoiler is the N7 hoodie in the photo! That is awesome and I totally want it. Sign up here to get the email when it goes on sale officially. It ships in December so keep that in mind.